Homeschool Naturalist is a monthly program. Homeschool Science Fair - Getting Started! The Douglas-Hart Nature Center is hosting a science fair for homeschool families on April 26 with an open viewing to the public on April 28th. Not sure what is a good topic? Not sure how to document the experiments? Already committed but want to learn more? Join Ms. Dakota on Thursday, March 28 at 1pm for this helpful session on how to participate in our Science Fair. Families must attend together. Please RSVP if planning on attending. 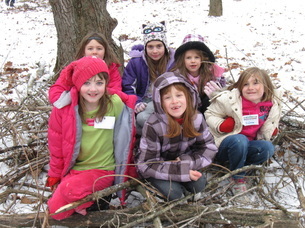 Homeschool Naturalist class registration requires payment at the time of signup. If you register for individual classes, enrollment is dependent on class availability – please call the morning of to see if there is a spot open. A semester rate guarantees your spot all semester. Paying for the entire semester saves $$$ too! Call the Nature Center at (217) 235-4644 to process a credit card over the phone. Douglas-Hart Nature Center staff reserves the right to cancel low attending classes. If a class is not listed, it means that specific class has been cancelled due to low enrollment.